The 2017 tax cut has received pretty bad press, and rightly so. Its proponents made big promises about soaring investment and wages, and also assured everyone that it would pay for itself; none of that has happened. Let me explain each point in turn. 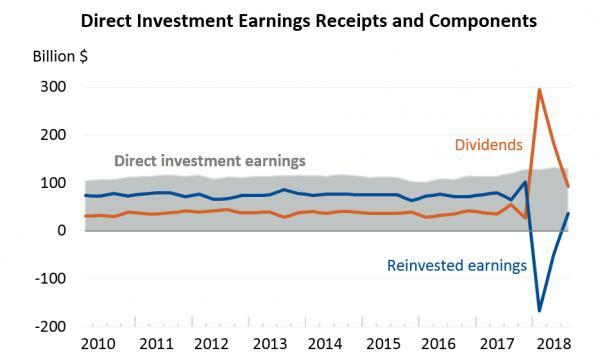 First, when people say that U.S. corporations have “brought money home” they’re referring to dividends overseas subsidiaries have paid to their parent corporations. These did indeed surge briefly in 2018, as the tax law made it advantageous to transfer some assets from the books of those subsidiaries to the home companies; these transactions also showed up as a reduction in the measured stake of the parents in the subsidiaries, i.e., as negative direct investment. But these transactions are simply rearrangements of companies’ books for tax purposes; they don’t necessarily correspond to anything real. Suppose that Multinational Megacorp USA decides to have its subsidiary, Multinational Mega Ireland, transfer some assets to the home company. This will produce the kind of simultaneous and opposite movement in dividends and direct investment you see in Figure 1. But the company’s overall balance sheet – which always included the assets of MM Ireland – hasn’t changed at all. No real resources have been transferred; MM USA has neither gained nor lost the ability to invest here. 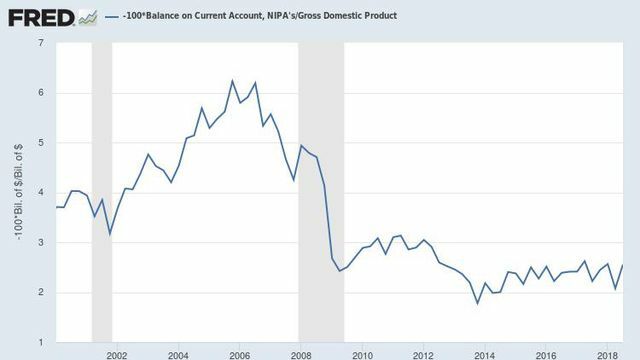 If you want to know whether investable funds are really being transferred to the U.S., you need to look at the overall balance on financial account – or, what should be the same (and is more accurately measured), the inverse of the balance on current account. Figure 2 shows that balance as a share of GDP – and as you can see, basically nothing has happened. So the tax cut induced some accounting maneuvers, but did nothing to promote capital flows to America. The tax cut did, however, have one important international effect: We’re now paying more money to foreigners. 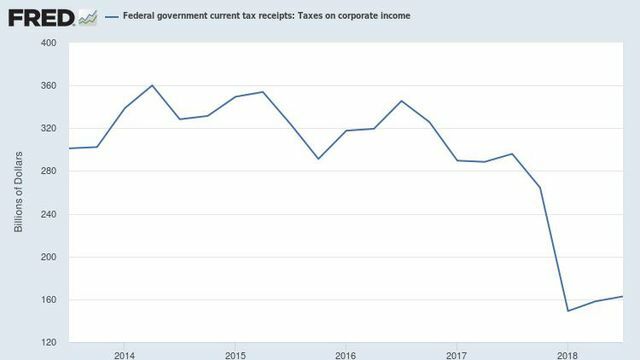 Bear in mind that the one clear, overwhelming result of the tax cut is a big break for corporations: Federal tax receipts on corporate income have plunged. The key point to realize is that in today’s globalized corporate system, a lot of any country’s corporate sector, our own very much included, is actually owned by foreigners, either directly because corporations here are foreign subsidiaries, or indirectly because foreigners own American stocks. Indeed, roughly a third of U.S. corporate profits basically flow to foreign nationals – which means that a third of the tax cut flowed abroad, rather than staying at home. This probably outweighs any positive effect on GDP growth. So the tax cut probably made America poorer, not richer. And it certainly made most Americans poorer. While 2/3 of the corporate tax cut may have gone to U.S. residents, 84 percent of stocks are held by the wealthiest 10 percent of the population. Everyone else will see hardly any benefit. Meanwhile, since the tax cut isn’t paying for itself, it will eventually have to be paid for some other way – either by raising other taxes, or by cutting spending on programs people value. The cost of these hikes or cuts will be much less concentrated on the top 10 percent than the benefit of the original tax cut. So it’s a near-certainty that the vast majority of Americans will be worse off thanks to Trump’s only major legislative success. As I said, even the mainly negative reporting doesn’t convey how bad a deal this whole thing is turning out to be. Paul Krugman has been an Opinion columnist for The New York Times since 2000 and is also a Distinguished Professor at the City University of New York Graduate Center. He won the 2008 Nobel Memorial Prize in Economic Sciences for his work on international trade and economic geography. John Doyle please tell me when will these economists like Krugman learn, they just refuse to face up to current macroeconomic reality. Call me slow, but what should “economists like Krugman” learn? Fool me once, more fool me. Fool me twice. more fool me again. Fool me thrice, proper idiot me.